A stable and transparent cloud market is essential if uptake of cloud services is to blossom. End consumers, potentially hundreds of millions of Europeans that access services over the Internet, indirectly benefit from a stable and resilient market. Governments backing ‘cloud first’ policies are more likely to fund projects that can procure cloud resources easily, on pricing that is transparently competitive. Finally, cloud vendors benefit from increased uptake of their services due to increased trust in the market as a result of transparency and resilience. Due to growing critical dependence on this infrastructure – the public cloud resources that underpin the Digital Single Market – it is necessary to understand measures that improve market transparency and resilience. The CloudWATCH Roadmap highlights the systemic risks developing in the Infrastructure as a Service market that are noteworthy to stakeholders seeking to shape policies for a fair, transparent and resilient cloud market. This document outlines how the cloud computing market is structured, why it is essential for Europe and the types of activities necessary to create a complete market. 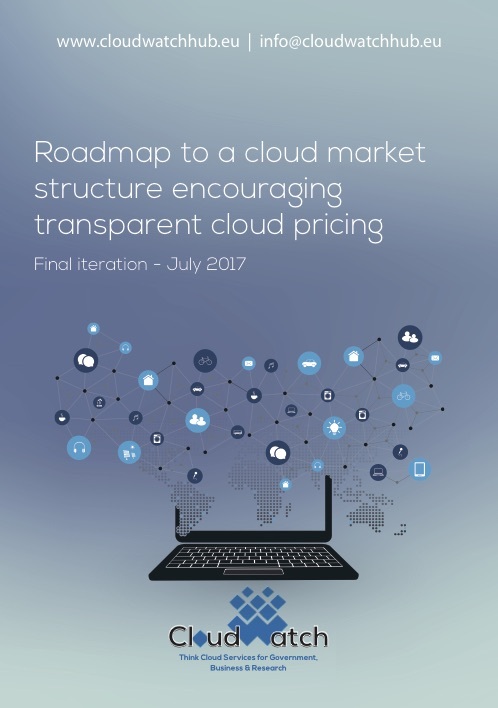 In April 2016, we published a Preliminary Version of this Roadmap, highlighting a number of risks to the global cloud computing market and hence to the digital economies that rely upon its on-demand computing capabilities. At that time, it was very unclear as to whether the market structure would evolve into a healthy, sophisticated market that encourages competition, or if its evolution would stall as a result of the dominant providers protecting their interests.